Also serving communities of Matthews, Pineville. There are 31 Assisted Living Facilities in the Charlotte area, with 28 in Charlotte and 3 nearby. The average cost of assisted living in Charlotte is $4,103 per month. This is higher than the national median of $3,346. Cheaper nearby regions include Huntersville with an average starting cost of $3,633. To help you with your search, browse the 303 reviews below for assisted living facilities in Charlotte. On average, consumers rate assisted living in Charlotte 4.0 out of 5 stars. Better rated regions include Huntersville with an average rating of 5.0 out of 5 stars. Caring.com has helped 25 families in Charlotte find high-quality senior care. To speak with one of our Family Advisors about assisted living options and costs in Charlotte, call (855) 863-8283. Charlotte, North Carolina, was the leader in gold production from 1799 until 1848 when the California gold rush began. This historic city is home to more than 62,000 seniors, some of whom may be in need of assisted living services. To support these seniors, there are 28 assisted living facilities in the city, with another three located in nearby communities. Assisted Living Residences (ALRs) as assisted living facilities in Charlotte and the rest of North Carolina are called, are regulated by The North Carolina Division of Health Service Regulation. Charlotte has a moderate climate with an average of 218 sunny days per year, 13 more than the national average of 205. Seniors who enjoy the outdoors may like living in Charlotte. The Charlotte Area Transit System (CATS) runs the city's public bus system. Seniors with a Medicare card can obtain a Transit ID card, which gives them half-price fares. North Carolina is fairly tax-friendly to seniors. Social security benefits are not taxed, however, retirement savings account withdrawals and pensions are fully taxed. Seniors in Charlotte who rely on social security for their monthly incomes may find that they have more money to put toward their healthcare budgets. The cost of living in Charlotte is 106.7, slightly higher than the U.S. average of 100. Healthcare expenses also rank higher than the average at 114. Seniors with tight budgets might want to keep the cost of living in mind when preparing for facility expenses. Charlotte has poor air quality. On a scale where 100 represents the areas with the cleanest air, Charlotte ranks 43, a full 15 points higher than the national average of 58. Seniors with respiratory issues like asthma or COPD might want to look for facilities in smaller communities in North Carolina. Charlotte has a violent crime rate of 34.3 and a property crime rate of 53.6, both significantly higher than the national averages of 22.7 and 35.4. Although these crime rates are higher than the average, seniors in assisted living are kept safe with safety precautions like alarms and security cameras. Assisted Living costs in Charlotte start around $4,103 per month on average, while the nationwide average cost of assisted living is $4,000 per month, according to the latest figures from Genworth’s Cost of Care Survey. It’s important to note that assisted living rates in Charlotte and the surrounding suburbs can vary widely based on factors such as location, the level of care needed, apartment size and the types of amenities offered at each community. 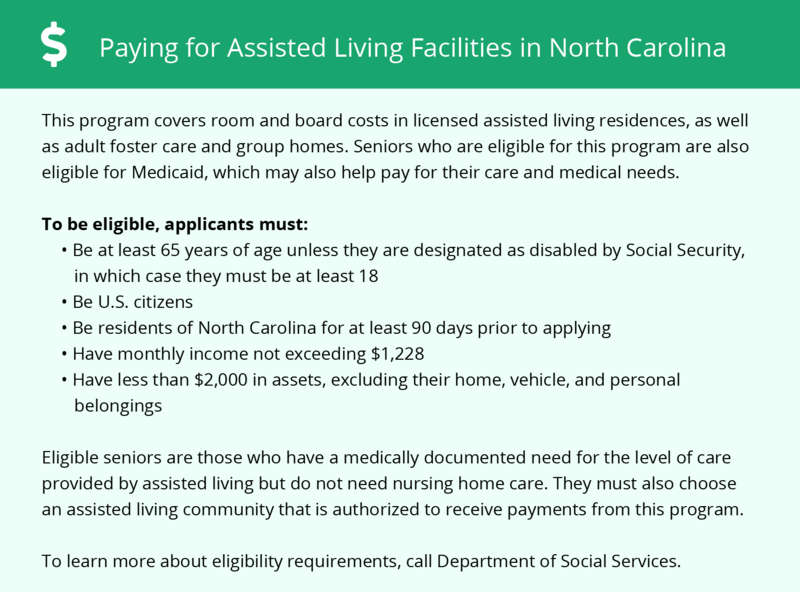 Seniors who need financial assistance to cover the costs of assisted living in Charlotte can apply for the State-County Special Assistance program and supplemental SSI payments. 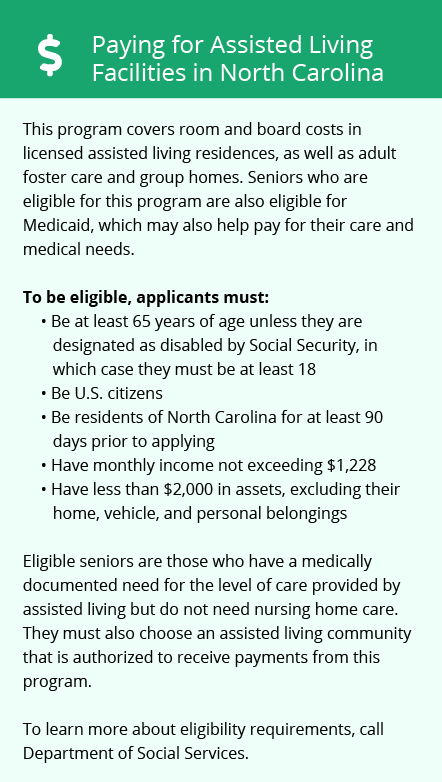 Both are separate from the state's Medicaid program, but can still be applied for through the Mecklenburg County Department of Social Services. The state's Medicaid program also offers a Personal Care Services (PCS) program that covers the costs of personal care services for seniors residing in assisted living facilities. Charlotte and the surrounding area are home to numerous government agencies and non-profit organizations offering help for seniors searching for or currently residing in an assisted living community. These organizations can also provide assistance in a number of other eldercare services such as geriatric care management, elder law advice, estate planning, finding home care and health and wellness programs. To see a list of free assisted living resources in Charlotte, please visit our Assisted Living in North Carolina page. Charlotte-area assisted living communities must adhere to the comprehensive set of state laws and regulations that all assisted living communities in North Carolina are required to follow. Visit our Assisted Living in North Carolina page for more information about these laws.